A tablet computer, or simply tablet, is a mobile computer with display, circuitry and battery in a single unit. Tablets come equipped with sensors, including cameras, a microphone, an accelerometer and a touchscreen, with finger or stylus gestures substituting for the use of computer mouse and keyboard. Tablets may include physical buttons (for example: to control basic features such as speaker volume and power) and ports (for network communications and to charge the battery). They usually feature on-screen, pop-up virtual keyboards for typing. Tablets are typically larger than smart phones or personal digital assistants at 7 inches (18 cm) or larger, measured diagonally. One can classify tablets into several categories according to the presence and physical appearance of keyboards. Slates and booklets do not have a physical keyboard and typically feature text input performed through the use of a virtual keyboard projected on a touchscreen-enabled display. Hybrids and convertibles do have physical keyboards, although these devices typically also make virtual keyboards available. Conceptualized in the mid-20th century and prototyped and developed in the last two decades of that century, tablet devices became popular in 2010. In March 2012, PC Magazine reported that 31% of U.S. Internet users owned a tablet, used mainly for viewing published content such as video and news. The top-selling line of devices was Apple's iPad with 100 million sold between its release in April 2010 and mid-October 2012, but iPad market share in 2013 (number of units) was down to 36% with Android tablets selling to 62%. Android tablet sales volume was 121 million devices, plus 52 million, in 2013 and 2012 respectively. Individual brands of Android operating system devices or compatibles follow iPad with Amazon's Kindle Fire with 7 million, and Barnes & Noble's Nook with 5 million. By May 2013, over 70% of mobile developers were targeting tablets (versus 93% for smartphones and 18% for feature phones). Tablet computers appeared in a number of works of science fiction in the second half of the 20th century, with the depiction of Arthur C. Clarke's NewsPad, in Stanley Kubrick's 1968 film 2001: A Space Odyssey, the description of Calculator Pad in the 1951 novel Foundation by Isaac Asimov, the Opton in the 1961 novel Return from the Stars by Stanislaw Lem, The Hitchhiker's Guide to the Galaxy in Douglas Adams's 1978 comedy of the same name, and the numerous devices depicted in Gene Roddenberry 1966 Star Trek series, all helping to promote and disseminate the concept to a wider audience. A device more powerful than today's tablets appeared briefly in Jerry Pournelle and Larry Niven's 1974 The Mote in God's Eye. In 1968, computer scientist Alan Kay envisioned a KiddiComp, while a PhD candidate he developed and described the concept as a Dynabook in his 1972 proposal: A personal computer for children of all ages, the paper outlines the requirements for a conceptual portable educational device that would offer functionality similar to that supplied via a laptop computer or (in some of its other incarnations) a tablet or slate computer with the exception of the requirement for any Dynabook device offering near eternal battery life. Adults could also use a Dynabook, but the target audience was children. The sci-fi TV series Star Trek The Next Generation featured tablet computers which were designated as "padds". In 1994, the European Union initiated the 'OMI-NewsPAD' project (EP9252), inspired by Clarke and Kubrick's fictional work. Acorn Computers developed and delivered an ARM-based touch screen tablet computer for this program, branded the NewsPad. The Barcelona-based trial ended in 1997. In 2001, Ericsson Mobile Communications announced an experimental product named the DelphiPad which was developed in cooperation with the Centre for Wireless Communications in Singapore, with touch-sensitive screen, Netscape Navigator as web browser and Linux as its operating system. Apple Computers launched the Apple Newton personal digital assistant in 1993. It utilised Apple's own new Newton OS, initially running on hardware manufactured by Motorola and incorporating an ARM CPU, that Apple had specifically co-developed with Acorn Computers. The operating system and platform design were later licensed to Sharp and Digital Ocean, who went on to manufacture their own variants. Chinese characters like this one meaning "person" can be written by handwriting recognition ( , Mandarin: rén, Korean: in, Japanese: jin, nin; hito, Cantonese: jan4). The character has two strokes, the first shown here in dark, and the second in red. 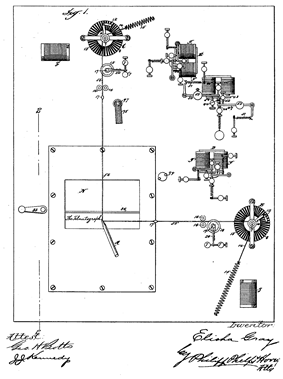 The black area represents the starting position of the writing instrument. 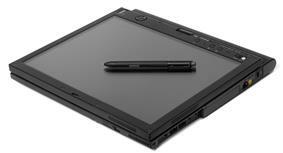 All version of the Windows OS since Vista have natively supported advanced handwriting recognition, including via a digital stylus. Windows XP supported handwriting with optional downloads from MS. The Windows handwriting recognition routines constantly analyze the user's handwriting to improve performance. Handwriting recognition is also supported in many applications such as Microsoft OneNote, and Windows Journal. Some ARM powered tablets, such as the Galaxy Note 10, also support a stylus and support handwriting recognition. Wacom and N-trig digital pens provide very, ≈2500 DPI resolution for handwriting, exceeding the resolution of capacitive touch screens by more than a factor of 10. These pens also support pressure sensitivity, allowing for "variable-width stroke-based" characters, such as Chinese/Japanese/Korean writing, due to their built-in capability of "pressure sensing". Pressure is also used in digital art applications such as Autodesk Sketchbook. Tablets without dedicated keyboards were the first tablets which gained commercial success, and they contributed highly to the general public tablet image. Slates are single-piece devices without any rotating or slide-out parts. 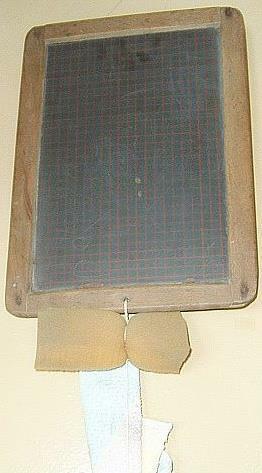 Writing slate with sponge (circa 1950). A slate's size may vary, starting from 7 inches (approximately 18 cm). Some models in the larger than 10-inch category include the Samsung Galaxy Tab Pro 12.2 at 12.2 inches, the Toshiba Excite at 13.3 inches and the Dell XPS 18 at 18.4 inches. As of March 2013, the thinnest tablet on the market was the Sony Xperia Tablet Z at only 0.27 inches (6.9 mm) thick. In October 2013, HP announced the HP Slate 21 All-in-One (Hybrid) with 21.5" IPS display complete with keyboard and mouse. It runs on Android, but has no internal battery. Samsung's Galaxy Note series were the first commercially successful phablet devices. Booklets are dual-touchscreen tablet computers with a clamshell design that folds like a laptop. Examples include the Sony Tablet P (which was considered a flop), the Toshiba Libretto W100 and the aborted Microsoft Courier. Booklets were discontinued in 2010. Tablets with dedicated keyboards form the boundary between slate tablets and laptop computers. Hybrids are tablets with a dedicated detachable keyboard, in some cases sold separately. Hybrid tablets have a standard tablet base with a detachable keyboard that resembles a laptop keyboard. They are usually sold together as parts of the same product, unlike slates, whose keyboards are an optional accessory. The term hybrid was coined by users of the HP/Compaq TC1000 and TC1100 series. Laplet is a portmanteau of the words laptop and tablet; it is a cross of these device types. Being in general a hybrid, it is different from other hybrids in the following ways: laplets are to run an x86-architecture CPU (typically low- or ultra-low-voltage model), such as Intel Core i5, run a full-featured OS like Windows 8.1, and have a number of typical laptop I/O ports, such as USB and Mini DisplayPort. Laplets are to be used not only as media consumption devices, but also as desktop or laptop replacements; laplets are designed to run desktop applications, such as Adobe Photoshop, and to connect peripheral devices, such as mouse, or keyboard, or a number of external displays. 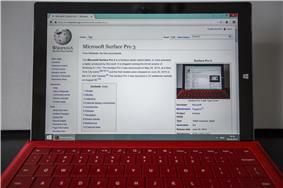 Microsoft's Surface Pro-series devices exemplify laplets. Convertible tablets have a slate tablet top-half with a keyboard bottom-half. They more closely resemble laptops, usually considered more as laptops than tablets, and are heavier and larger than slates. While some convertibles (such as the Asus Transformer series) run Android, the release of Windows 8 increased the prominence of this form factor among the laptop market. Typically, the base of a convertible attaches to the display at a single joint called a swivel hinge or rotating hinge. The joint allows the screen to rotate through 180° and lie against the back of the keyboard to provide a flat writing surface. This design, although the most common, creates a physical point of weakness. The Panasonic Toughbook 19, for example, is advertised as a more durable convertible notebook. The HP EliteBook 2760p convertible notebook uses a reinforced hinge that protrudes slightly from the rear of the unit. And the Acer TravelMate C210, has a sliding design in which the screen slides up from the slate-like position and locks into place to provide the laptop mode. The first tablet to have a sliding screen was the Samsung Sliding PC7 Series, a tablet with Intel Atom processor and a sliding screen that allows it to be used as a laptop or slate tablet when the screen is locked in place covering the whole keyboard. It is intended to combine the virtues of tablet PCs with those of notebooks. The Inspiron Duo from Dell rotates the screen horizontally when opened. Intel's x86, including x86-64 has powered the "IBM compatible" PC since 1981 and Apple's Macintosh computers since 2006. The CPUs have been incorporated into tablet PCs over the years and generally offer greater performance along with the ability to run full versions of Microsoft Windows, along with Windows desktop and enterprise applications. Non-Windows based x86 tablets include the JooJoo. Intel announced plans to enter the tablet market with its Atom in 2010; see the next section for Intel processors for the tablet market. Intel tablet chip sales were 1 million units in 2012, and 12 million units in 2013. Intel chairman Andy Bryant has stated that its 2014 goal is to quadruple its tablet chip sales to 40 million units by the end of that year, as an investment for 2015. Tablets, like conventional PCs, run multiple operating systems (though dual-booting on tablets is relatively rare). These operating systems come in two classes, desktop-based and mobile-based ("phone-like") OS. Desktop OS-based tablets are currently thicker and heavier, require more storage, more cooling and give less battery life, but can run processor-intensive applications such as Adobe Photoshop in addition to mobile apps and have more ports, while mobile-based tablets are the reverse, only run mobile apps. Those that focus more so on mobile apps use battery life conservatively because the processor is significantly smaller. This allows the battery to last much longer than the common laptop. At the end of Q1 2013, GlobalWebIndex noted that in two years tablet usage increased by 282 percent, with 156 million Android tablet users and 122 million iPad users making up 75 percent. By year-end 2013, Gartner found that 121 million (plus 53M in 2012) Android tablets, 70 million (plus 61M in 2012) iOS tablets, and 4 million (plus 1M in 2012) Windows tablets had been sold to end-users (2013 and 2012 results). Google Nexus 9 running Android 5.0. On June 18, 2012, Microsoft launched the Microsoft Surface tablet (initially named Surface RT upon release), the first computer in the company's history. Also Microsoft Surface Pro laplet was released — a laptop replacement in a tablet form factor. Surface runs Windows RT and comes with a copy of Office 2013, which gives a customer access to Word, Excel, PowerPoint and OneNote. It comes with a Tegra 3 SoC, one kickstand position, USB 2.0 port, microSD card slot to expand storage and one-megapixel cameras (front and back). It has been succeeded by Surface 2 in 2013. The Surface Pro contains similar hardware to a standard laptop. The device does not come equipped with Office 2013. It contains an Intel Core i5 processor, USB 3.0 port, Windows 8 Pro (free update to Windows 8.1 Pro available) and allows the user to run traditional desktop applications. Two successors has been released since the release of the first device, Surface Pro 2 and Surface Pro 3. Qt-based Qtopia and GTK+-based Internet Tablet OS provide open source systems. KDE's Plasma Active is a graphical environment for tablet. Several hardware companies have build hybrid devices with the possibility to work with both the Windows 8 and Android operating systems. In mid-2014, Asus released a hybrid touchscreen Windows tablet/laptop with a detachable Android smartphone; when docked to the back of the tablet/laptop display, the Android phone is displayed within the Windows 8 screen, which is switchable to Android tablet and Android laptop. Apple, Google, Amazon, Microsoft and Barnes & Noble all adopted the strategy. The latter originally allowed arbitrary apps to be installed, but, in December 2011, excluded third parties. Apple and IBM have agreed to cooperate in cross-selling IBM-developed applications for iPads and iPhones in enterprise-level accounts. Among tablets available in the market, Apple's iPad (left) is the top-selling tablet with 170 million units sold by mid-October 2013, followed by Amazon's Kindle Fire (right) with an estimated 7 million sold as of May 2012. According to a survey conducted by the Online Publishers Association (OPA) in March 2012, 31% percent of Internet users in the United States owned a tablet, up from 12% in 2011. The survey also found that 72% of tablet owners had an iPad, while 32% had an Android tablet. By 2012, Android tablet adoption had increased. 52% of tablet owners owned an iPad, while 51% owned an Android-powered tablet (percentages do not add up to 100% because some tablet owners own more than one type). 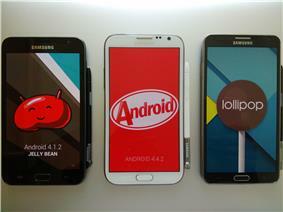 By end of 2013, Android's market share rose to 61.9%, followed by iOS at 36%. By late 2014, Android's market share rose to 72%, followed by iOS at 22.3% and Windows at 5.7%. Tablet use by businesses has jumped in the 2010s, as business have started to use them for conferences, events and trade shows. In 2012, Intel reported that their tablet program improved productivity for about 19,000 of their employees by an average of 57 minutes a day. In the US and Canada, it is estimated that 60% of online consumers will own a tablet by 2017 and in Europe, 42% of online consumers will own one. As of the beginning of 2013, 29% of US online consumers own tablet computers, a significant jump from 5% in 2011. As of the beginning of 2014, 44% of US online consumers own tablets. Tablet use has also become increasingly common amongst children. A 2014 survey found that touch screens were the most frequently used object for play amongst American children under the age of 12. Touch screen devices were used more often in play than game consoles, board games, puzzles, play vehicles, blocks and dolls/action figures. Despite this, the majority of parents said that a touch screen device was "never" or only "sometimes" a toy. As of 2014, nearly two-thirds of American 2-to 10-year-olds have access to a tablet or e-reader. The large use of tablets by adults is as a personal internet-connected TV. Research firms Gartner and IDC both predict that tablet sales will exceed traditional personal computer (desktops, notebooks) sales in 2015. ^ Editors PC Magazine. 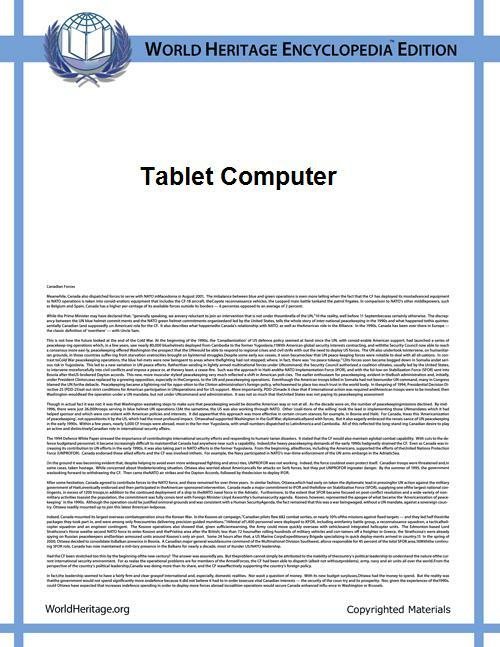 "Definition of: tablet computer". ^ Moscaritolo, Angela (June 18, 2012). "Survey: 31 Percent of U.S. Internet Users Own Tablets". ^ Chen, Brian X. (October 23, 2012). "Apple, Facing Competition, Introduces a Smaller iPad of no significant change". ^ Chen, Brian X. (October 19, 2012). "How Are 7-Inch Tablets Doing?". ^ Poeter, Damon (December 27, 2012). 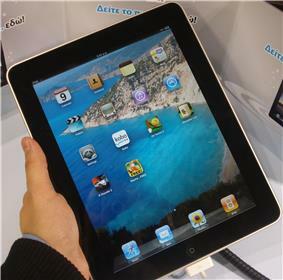 "Non-Apple Tablets Making Small Gains on iPad | News & Opinion". PCMag.com. Retrieved July 8, 2013. ^ "Massacre of the tablets | FP Tech Desk | Financial Post". Business.financialpost.com. December 24, 2011. Retrieved June 14, 2013. ^ Did Arthur C Clarke invent the iPad? ^ "I keep wishing for a real tablet--one that would function as the pocket computer we described in The Mote in God's Eye". — Pournelle, Jerry (July 8, 2011). "Jerry Pournelle Is Back in the House". Retrieved June 25, 2014. ^ Kay, Alan (1972). "A Personal Computer for Children of All Ages". ^ "Star Trek PADD". Retrieved June 21, 2014. ^ Editors Risc User Magazine. "The Story of NewsPAD". Risc User. Retrieved February 20, 2013. 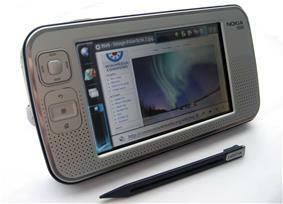 ^ "Ericsson, CWC develop Linux handheld PC". January 12, 2001. Retrieved August 14, 2013. ^ "///Ericsson Forum - Infos and support". March 21, 2012. Retrieved August 14, 2013. ^ McCracken, Harry (January 27, 2010). "The Long Fail: A Brief History of Unsuccessful Tablet Computers". Retrieved August 18, 2014. ^ "Microsoft Releases Pocket PC". Microsoft.com. Microsoft. Retrieved May 9, 2014. ^ "Tablet PC: Coming to an Office Near You?". datamation.com. Retrieved September 8, 2013. ^ "The iPad's victory in defining the tablet: What it means". ^ Gilbert, Jason (August 19, 2011). "HP TouchPad Bites The Dust: Can Any Tablet Dethrone The IPad?". Huffington Post. Kevin Parrish (October 28, 2010) "Microsoft's Ray Ozzie sees Post-PC world", Tom's Hardware US "It's important that all of us ... form a realistic picture of what a post-PC world would actually look like ... Those who can envision a plausible future that's brighter than today will earn the opportunity to lead [in the market]." —Ray Ozzie's memo to Microsoft on the eve of his retirement. ^ Worstall, Tim (July 2, 2011). "iPad: One of the Most Successful Products Ever". Forbes. Retrieved June 10, 2013. ^ "Can’t Decide Between Windows or Android? Samsung’s ATIV Q Convertible Does Both.". June 20, 2013. ^ "[단독]삼성 괴물 노트북 '아티브Q' 전면 보류". ZDNet Korea (in Korean). ^ Latest gadgets from Nokia, Asus and Samsung. 3 News NZ. September 30, 2013. ^ "Tablet Solutions by Industry". Retrieved August 18, 2014. ^ "1 in 4 B2B Companies Report Use of Tablets to Aid Sales-Related Activities". MarketingCharts. February 19, 2014. Retrieved August 20, 2014. ^ Barnett, Shawn. "Jeff Hawkin". The man who almost single-handedly revived. Pen Computing Magazine. ^ Notebook sales growth goes negative. Can we blame the iPad yet? ^ "Handwriting Recognition on Windows Vista". windows.microsoft.com. Microsoft. Retrieved May 9, 2014. ^ Buxton, Bill. "Multitouch Overview"
^ Franklin, Eric (October 30, 2012). 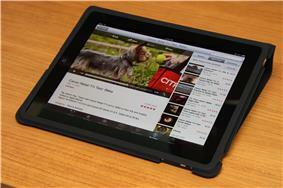 "Tablets buying guide | Tablets - CNET Reviews". Reviews.cnet.com. Retrieved June 14, 2013. ^ Franklin, Eric (April 10, 2012). 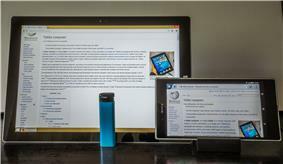 "The Toshiba Excite 13 sports the largest tablet screen yet | Android Atlas - CNET Reviews". Reviews.cnet.com. Retrieved June 14, 2013. ^ King, Charles. "Dell’s XPS 18 is the latest ‘big tablet’ innovation". TabTimes. Retrieved June 30, 2013. ^ "Xperia™ Tablet Z | Waterproof and dustproof tablet". Sony. March 26, 2013. Retrieved June 14, 2013. ^ "Hewlett-Packard has the Slate 21 an all-in-one PC with Android". Retrieved October 26, 2013. ^ "Events". Apple. Retrieved June 14, 2013. 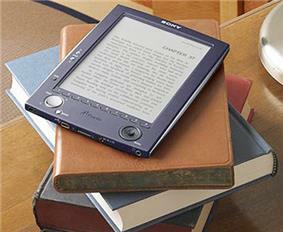 ^ Heather Kelly and Doug Gross - Amazon announces new wave of Kindles - CNN Tech - September 6, 2012. Retrieved December 2, 2012. ^ Kay, Roger. "5" Is the market ready for a 'phablet'?". Forbes. ^ "5" Smartphones: LG Optimus Vu vs. Samsung Galaxy Note". February 14, 2012. ^ "The 8 biggest product flops of 2012 (#4)". Marketwatch. Retrieved June 30, 2013. ^ Dubie, Denise (April 29, 2010). "Microsoft kills courier tablet project: Apple’s iPad influence likely crushes Microsoft tablet". NetworkWorld. Keller, Mike (April 29, 2010). "Microsoft Courier Tablet Canceled! : Gizmodo reports today that Microsoft’s much-hyped Courier tablet has been canceled.". PC World. ^ "It's a tablet! It's a laptop! It's a laplet! It's a tabtop!". Tech Radar. Retrieved August 20, 2014. ^ "Here Come the Hybrid ‘Laplets.’ Should You Care?". Wired. Retrieved August 13, 2014. ^ "Intel shows pricing pressures for Atom due to competition from ARM". Retrieved October 17, 2010. ^ "Intel launches FPGA-equipped Atom". Retrieved November 23, 2010. An FPGA, or field programmable gate array can then be custom-programmed by tablet computer vendors who have purchased these integrated circuits from the semiconductor device manufacturers; in October 2013, Intel's foundry operation announced plans to build FPGA-based quad cores for ARM processors, as well as for x86 . ^ "Apple iPad Price, Features Say "ARM" All Over". bnet. ^ Tim Barjarin (July 16, 2012). "ARM vs. Intel: How the Processor Wars Will Benefit Consumers". ^ "The Economist - Space invaders, America’s Intel and Britain's ARM have long dominated different bits of the global chip market. Now each is attacking the other’s stronghold". January 7, 2012. ^ """Intel Chairman: "We Seemed to Have Lost Our Way. November 21, 2013. Retrieved November 21, 2013. ^ Asraf Essa "Campaign Seems Negative for ARM". Retrieved December 23, 2013. Fried, Ina (November 20, 2014). "Intel Probably Won’t Reach 70 Million Tablet Chips Next Year, CEO Says". Retrieved 2014-11-22. : Mobile operating losses will be approximately $4 billion, and $3.2 billion in 2014, and 2015, respectively. ^ "Microsoft Surface Pro review". engadget. Retrieved June 16, 2013. ^ Westover, Brian (2014-10-26). "Laptops vs. Tablets: The Ultimate Showdown". PCmag.com. ^ "Study: Android Tablets Surpass iPads In Q1, Tablet Usage Up 282% Since 2011". June 10, 2013. ^ a b c "Gartner Says Worldwide Tablet Sales Grew 68 Percent in 2013, With Android Capturing 62 Percent of the Market". Gartner. March 3, 2014. Retrieved April 17, 2014. ^ "9 Upcoming Tablet Alternatives to the Apple iPad". Mashable. Retrieved August 7, 2010. ^ "Don’t bank on KMart’s $150 Augen tablet getting Android Market access". liliputing. Retrieved August 7, 2010. ^ "Lenovo is waiting for Honeycomb". Retrieved October 24, 2010. "Google demonstrated Android Honeycomb Tablet". December 7, 2010. ^ "15 best Android tablets in the world". Cnet. Retrieved June 12, 2013. ^ "Six Years Ago, Apple Made a Crowd Gasp With Pinch to Zoom and Swiping". Retrieved June 12, 2013. ^ "Apple tablet rumors redux: 10.7-inch display, iPhone OS underneath". Engadget. Retrieved August 6, 2010. ^ Tifanny Boggs (2007) "Axiotron and OWC Unveil the ModBook"
^ "Live from Steve Ballmer's CES 2010 keynote". Engadget. Retrieved August 4, 2010. ^ "ASUS Eee Pad EP101TC opts for Android, dumps Windows Embedded Compact 7". Engadget. Retrieved May 28, 2013. ^ "Microsoft Surface based Windows Tablet announced". ^ "Surface RT - The Original Microsoft Tablet". Microsoft.com. Retrieved December 3, 2013. ^ Einstein, Dave (October 11, 2012). "Microsoft Betting BIG on Cloud with Windows 8 and Tablets". Forbes. Retrieved October 27, 2012. ^ Miller, Michael. "Build: More Details On Building Windows 8 Metro Apps". PC Magazine. Retrieved February 10, 2012. ^ Gara, Tom. "What Does the ‘RT’ In Windows RT Stand For?". Wall Street Journal. Retrieved July 10, 2013. ^ "Best Windows 8 tablets: all the Windows 8 tablets we've reviewed". Tech Radar. Retrieved June 12, 2013. ^ One of the following Windows OSs will be discontinued: Windows Phone, Windows RT, and Windows 8 Foley, Mary Jo (November 25, 2013). "Microsoft aims to whittle Windows variants on mobile: A Microsoft official confirms the company is planning to trim the number of different versions of Windows in its portfolio". Retrieved November 25, 2013. ^ Palladino, Valentina. "Mozilla is testing the first Firefox OS tablet prototype". ^ "Ubuntu coming to tablets, phones and smart TVs by 2014". ^ Orlowski, Andrew. "Nokia's Great Lost Platform". The Register. ^ "Nokia's Great Lost Platform - Page 4". ^ Sousou, Imad. "What's Next for MeeGo". meego.com. Retrieved September 28, 2011. ^ "Scenes from the Sabu sentencing: "I’m not the same person you saw three years ago." Microsoft really is "all in" on the cloud, but is IT going to follow? Top ISPs threaten to innovate less, spend less on network upgrades Google and Microsoft are out to stop dual-boot Windows/Android devices". Ars Technica. March 14, 2014. Retrieved June 2, 2014. ^ Lai, Richard (June 2, 2014). "ASUS Transformer Book V is a Windows hybrid laptop with a detachable Android phone". ^ "LG Electronics Acquires webOS from HP to Enhance Smart TV". Retrieved June 10, 2013. ^ Carr, Austin (December 17, 2011). "Kindle Fire Vs. Nook Tablet: "Choice" And Trash Talk". fastcompany.com. Retrieved March 28, 2012. ^ Mack, Eric (December 22, 2011). "How to root the Nook Tablet". Gizmag.com. Retrieved March 28, 2012. ^ Nita, Sorin (November 17, 2011). "Nook Tablet Can Sideload Android Apps without Needing Root". news.softpedia.com. Retrieved March 28, 2012. ^ Smith, Peter (December 21, 2011). "Kindle Fire and Nook Tablet both get 'upgraded' with reduced functionality". IT World. Retrieved January 10, 2012. ^ Verry, Tim (December 21, 2011). "Kindle Fire and Nook Tablet Receive Root Access Killing Software Updates". PC Perspective. Retrieved January 10, 2012. ^ Parishon, Joseph (December 20, 2011). "Nook Tablet firmware update 1.4.1 disables sideloading apps". TheVerge.com. Retrieved March 28, 2012. ^ "B&N NOOK Tablet 1.4.1 update kills sideloading, lets you keep apps installed so far". Liliputing.com. Retrieved March 28, 2012. ^ Wolverton, San Jose Mercury News, Troy (November 25, 2011). "Barnes & Noble's new Nook Tablet doesn't measure up to Kindle Fire: Barnes & Noble's latest digital tablet may be an upgrade to the Nook Color, but is not as strong as Amazon.com's Kindle Fire". Seattle Times. Retrieved March 28, 2012. ^ Hesseldahl, Arik (July 15, 2014). "Apple and IBM Team Up to Push iOS in the Enterprise". Retrieved July 15, 2014. ^ Angela Moscaritolo (2012-06-18). 31 Percent of U.S. Internet Users Own Tablets "Survey: 31 Percent of U.S. Internet Users Own Tablets". PC Magazine. Retrieved 2012-10-20. ^ "ASUS and Samsung gain wide swaths of tablet market share in Q3". October 30, 2013. ^ "iPad Market share analysis". October 31, 2013. ^ Stevenson, Kim. "Intel IT Performance Report". Intel. ^ Gownder, JP. "Global Business And Consumer Tablet Forecast Update, 2013 To 2017". Forrester. ^ Fingas, Jon (February 11, 2014). "Two-thirds of Americans now have smartphones". ^ The Michael Cohen Group (February 17, 2014). "Touch Screens". ^ "Gartner Says Apple Will Have a Free Run in Tablet Market Holiday Season as Competitors Continue to Lag". ^ "Gartner Says Worldwide Media Tablets Sales to Reach 119 Million Units in 2012". ^ "Gartner Says Worldwide Traditional PC, Tablet, Ultramobile and Mobile Phone Shipments Are On Pace to Grow 6.9 Percent in 2014". ^ "IDC Forecasts Worldwide Tablet Shipments to Surpass Portable PC Shipments in 2013, Total PC Shipments in 2015".